Tory Burch Reva flat $156 at Bergdorf Goodman! - shopalicious! 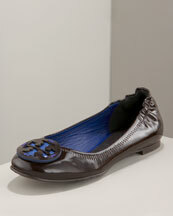 Tory Burch Reva flat $156 at Bergdorf Goodman! Tory Burch's signature Reva flats, with their graphic insignia at the toe are undisputed classics, at least in my book! And at under $200, they're an affordable luxury, indeed. Pair them with your jeans for an instant dash of designer style, or with a fitted skirt and crisp, white blouse for work. Best yet, they're on sale! This pair in chocolate brown, trimmed in blue, is $156.00, regularly $195.00, from Bergdorf Goodman.